V10 power in a family sedan. You beauty! Audi dangled a juicy 426kW carrot half-way through the launch of its new A6 range and those present abruptly turned into rabbits, so to speak. Or maybe that should be hares. 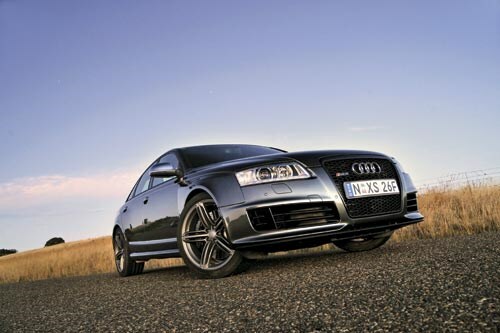 Parked outside a café in Corryong were three of the new RS6 sedans, Audi’s hulking four-door supercar and its impertinent ‘up yours’ to BMW’s M5 and Mercedes-Benz’s E63 AMG. 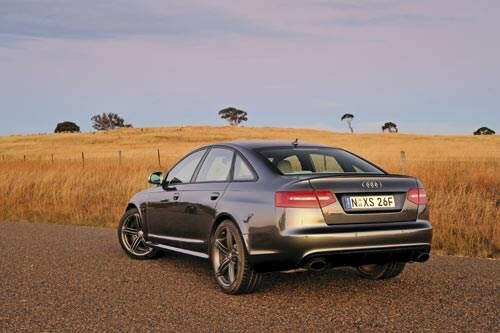 Having just done some hard kays in a new A6 sedan powered by the excellent new 213kW supercharged 3.0-litre V6 – the company’s first supercharged engine – the promise of exactly twice as much power in the same chassis, albeit substantially tweaked, had us gulping down lunch faster than normal. Our carrot sampling would be quick too, just a too-short 50km burst on the sinewy Snowy Mountain Hwy, so a pre-drive dose of carotene would have been handy to get one’s eyes up to speed with the ferocious acceleration that a 5.0-litre, twin-turbo V10 with 650Nm and quattro AWD can produce. But in the absence of carrot juice, I had to rely on a shot of espresso to speed up my reactions. Apart from a muffled rumble somewhere ahead of the windscreen, the RS6’s forward progress is genteel at town speeds but awaken the twin snails with a stab on the throttle and quick 1/10th of a second Tiptronic downshift – via paddles or shifter – and all hell breaks loose; 572 horsepower will do that. But it does it so quietly; this car is a stealth bomber. We barely see the redline in any gear, there is no room on this tight tourist road to give the engine that much free reign. 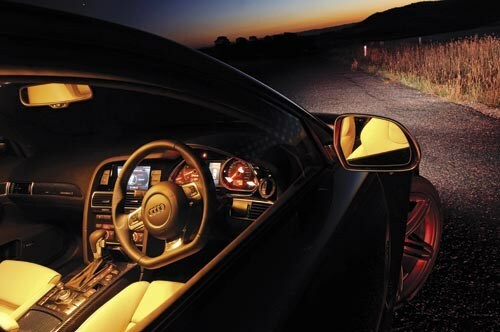 The RS6 advances towards tomorrow at such a prodigious rate that you end up short-shifting, grabbing for the next of six gears before the tacho has completed its arc into the red. Every rapid-fire ratio change is accompanied by a strange staccato ‘pfffttt’ from the exhaust and another relentless surge of exhilarating power. A snatched glance at the speedo shocks. So smooth is the engine and so effortless the acceleration, we are doing a good 40-50km/h faster than we think before each short section of straight road runs out. The V10 has Audi’s FSI direct injection and race-style dry sump lubrication and peak torque arrives at just 1500 rpm and is still there at 6250rpm, which is where peak power is reached and still available at 6700rpm. 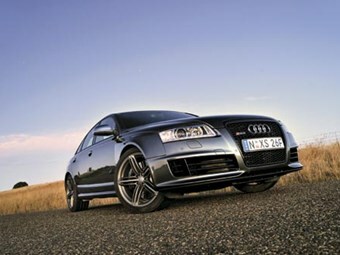 It’s a monster engine and the RS6 is a quantum leap on the revered but now mothballed RS4. According to Audi, the RS6 knocks over the 0-100 sprint in 4.5 seconds and will hit 200km/h in just 14.8 and charge on to a limited 250km/h. It’ll even average a claimed 13.9L/100km but not at these speeds. At 1985kg, it’s no lightweight but with well-weighted steering, Dynamic Ride Control (Sport, Dynamic or Comfort) sorting out the damping, massive 390mm discs/six-piston calipers up front and 365mm/single piston rears (another $20,867 gets you lighter, 420mm eight-piston ceramic front stoppers) and 20-inch wheels with 275/35 rubber, turn-in and mid-corner grip are prodigious. As always the mechanical is backed up by the electronic and the RS6’s handling is faithfully monitored by ESP but it is calibrated to allow more exuberant driving, as the quattro system is biased towards rear drive. It has grip by the bucket load. Audi expects 50 people a year to stump up $263,500 for an RS6, which comes standard with MMI navigation system, dual-zone air, acoustic parking assistant, D-shaped sports steering wheel and boost pressure indicator (1.6 bar maximum). You have to buy your own carrot juice.